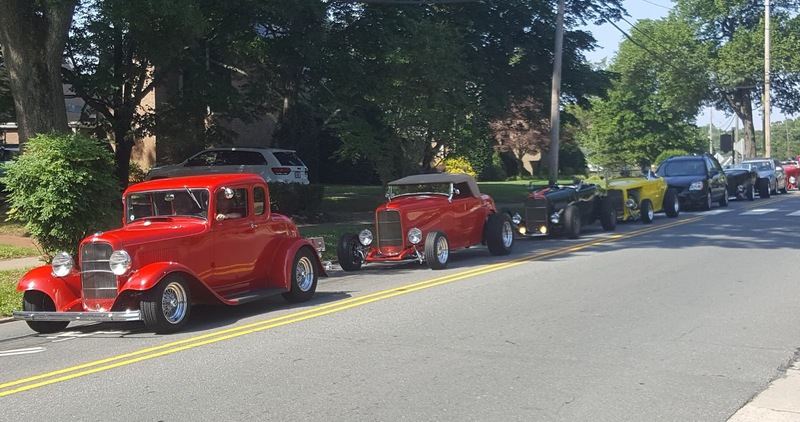 Looking for something to do Saturday morning to help out around town? Here's an opportunity. Regardless, the trash needs to be picked up. Citizens Invited to Lakeshore Clean-Up Project: Saturday, July 29 from 8:30 a.m. to 12:00 p.m. The Davidson Police, Parks and Recreation, and Public Works Departments are partnering on a lakeshore clean-up project on Saturday, July 29 from 8:30 a.m. to 12:00 p.m. All citizens are invited to participate, especially those who live along the shore of Lake Davidson. Volunteers should check in at the entrance to the Lake Davidson Nature Preserve, located behind Davidson Day School at 750 Jetton Street. Parking is available at Davidson Day School. Volunteers will be assigned different portions of the shoreline to clean up and the Town of Davidson will distribute trash and recycling bags, latex gloves, and litter pickers. Members of the public works department will circulate to pick up filled trash and recycling bags. Please wear sunscreen and bring water. Please call the Davidson Department of Parks and Recreation at 704-892-3349 with any questions. The first time I saw Kurt Naas speak was several years ago when the Red Line commuter rail project was making one of its numerous attempts to get off of life support. Naas was giving a presentation for the Cornelius Town Board exposing flaws in the plan put together by a highly paid group of consultants. Naas presented information that was professional, well thought out, and as thorough as anything the consultants brought to the table, and he had done it for free. Since then, Kurt Naas has become a household name here in North Mecklenburg. His is a name synonymous with citizen advocacy and leadership, a name of someone willing to fight for the public's best interest. Tuesday, Kurt Naas put that name in the ring for the next contest for Cornelius Town Board. Here is the press release put out by his campaign. Kurt Naas, leader of the citizens group WidenI77 that opposed the I-77 toll project since 2012, announced his candidacy for Cornelius Commissioner. According to Naas, years of fighting the I-77 tolls emphasized the need for elected officials who will listen to the people, carefully research the issues and stand firm on convictions. When he formed the group in 2012 most elected officials in the region were convinced tolls were the only answer and largely ignored warnings from Naas and others who had thoroughly researched the plan. Today all North Mecklenburg towns and Mecklenburg and Iredell counties have passed resolutions opposing the project. “Back in 2012 I realized that it was going to take a community-wide effort to stop try and stop this project. It clearly is not in our region’s best interests,” Naas says. In response he formed the group WidenI77. The organization grew into a prominent grassroots movement, eventually reaching thousands of citizens through several town hall-style presentations and Naas’ hundreds of blog posts. For his efforts the North Carolina Open Government Coalition named him their 2015 “Citizen of the Year”, and last year the Lake Norman Chamber of Commerce recognized his organization with a Distinguished Service Award. In addition to fighting the toll project, Naas has served the community in other ways. He served on Cornelius’ Transportation Advisory Board for five years and currently serves on the DDI Landscaping Design Committee. Recently Naas was instrumental in stopping a NC Senate bill aimed at making it virtually impossible for citizens to sue the NCDOT. Senate Bill 613 would require the legal firm of a plaintiff suing the NCDOT to post a bond to cover NCDOT’s legal fees, and NCDOT would set the amount of the bond. Another cause for Naas has been encouraging town officials to install Adaptive Signal Control Technology (ASCT) on traffic lights. The technology adapts signal light timing to changing traffic conditions and typically increases the number of cars through an intersection by 10-to-30 percent. “As crowded as our intersections are, it really makes sense,” Naas says. “There are thousands of installations throughout the Southeast but none in North Carolina.” After individual meetings with board members were ineffective he eventually found a receptive audience with town staff. “Since then they’ve made great progress with the plan for ASCT lights,” he says. The West Catawba corridor is slated to be the first North Carolina installation in early 2018. NCDOT is sharing the cost and the vendor is cutting its price to gain a foothold in North Carolina. If it proves effective, NCDOT will look at rolling out the technology to other areas of the state. Naas has already lined up the endorsements of a dozen elected officials including Republicans and Democrats from across the Lake Norman Region. “The breadth of endorsements demonstrates I can work with people across the political spectrum on local and regional issues,” he says. Naas began his career as an aerospace engineer with General Dynamics Space Systems Division where he worked on the guidance platform for the Atlas and Centaur rockets. After graduate school he worked for AlliedSignal where he led the global product support launch for their microturbine business, and subsequently held executive positions with Honeywell and Ingersoll Rand. He owns a manufacturing business in Cornelius, lives in the Peninsula neighborhood and attends Pritchard Memorial Baptist Church in Charlotte. He’s been married to Maria for 28 years and they have one son, Stephen, 19, who is a two-time Golden Gloves state boxing champion. Naas holds an MBA from the Kellogg School (Northwestern) and a Master’s in Engineering Management, also from Northwestern. He completed the dual-major, six-quarter program in five quarters while undergoing chemotherapy and he graduated at the top of his class. He is a member of Sigma Gamma Tau, a national aerospace honor society, and Beta Gamma Sigma, an honor society for collegiate schools of business. For more information about Naas’ candidacy for Cornelius Commissioner can be found at www.electkurtnaas.com. The tenure of Mi-Connection CEO David Auger has been one of the few bright spots in the whole saga of the municipally owned cable company, so when Auger announced last year that he would be retiring, that was going to surely leave a big leadership gap in the company. Adding to the uncertainty, little to nothing had been said about the search for his replacement. 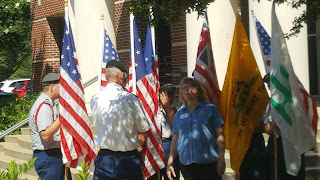 With the announced end date of June 30th rapidly approaching, last week aShortChronicle asked the public information officers for Davidson and Mooresville if there was any update. Monday, that update came in the form of a press release on the next Mi-Connection Board meeting later this week. The MI-Connection Board of Directors will hold a meeting on Wednesday, June 28 at 6:30 p.m. in the Davidson Town Hall board room to appoint and re-appoint board members, elect officers for FY 2017-2018, approve minutes from the April meeting, and approve the final recast of the FY 2017 budget. This meeting was originally scheduled for Thursday, June 29. This meeting is open to the public. Additionally, the MI-Connection Board of Directors requested that David Auger continue in his CEO role for the foreseeable future and he agreed. Auger was originally scheduled to retire June 30. 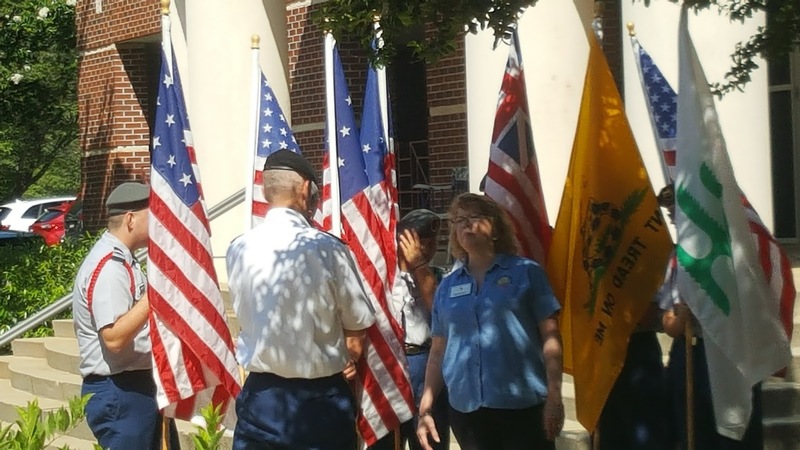 The next quarterly meeting of the MI-Connection Board of Directors is scheduled for August 24 at 6:30 p.m. in the Davidson Town Hall board room. This meeting is open to the public. While it is definitely good news that Auger will stay on for the time being, it also makes one wonder if the reasons why included not able to find a good replacement. Looking at the Mi-Connection overall situation it is not hard seeing that being the case. If you just looked at the bottom line, the company looks like it's still in need of a turnaround specialist. However, that would be too much of a simplification. Under Auger's tenure the company has attained EBITDA percentages at or above industry averages. Earnings Before Interest Taxes Depreciation Amortization is a measure of operational performance. The Auger years have seen operations brought back in house from an outsourcing vendor. The outstanding debt has been refinanced. The company has also achieved high penetration rates in new developments like the one at Langtree. Effectively, David Auger has been the turnround specialist and operationally he has achieved a lot. At this point, the proactive steps to fundamentally improve the company that can be taken have been. What is hammering the bottom line is servicing the outstanding debt. Other than selling the company, the only way out of that debt burden now is a risky, long hard slog of significant growth through competition in a marketplace growing more competitive by the day. It is not hard to see it being difficult to find someone who wants that job. Mi-Connection comments raise the recurring question..."What is the plan?" At the June 13th Board Meeting, there were some interesting public comments from citizens. That's always a good thing to see. One comment from Joe Seferyn of Davidson regarding Mi-Connection has been getting some traction on social media. Seferyn asked a number of questions about plans for the system in light of the ongoing losses. aShortChronicle has obtained a written copy of Mr Seferyn's comments in their entirety for your reading pleasure. In the budget review presented by Pieter a few weeks ago, sadly the issue of MI-Connection got no attention. It is shocking that a million dollar line item in the budget received no discussion at all. Since Mooresville and Davidson purchased the company about 10 years ago, the cost of the losses to the Davidson tax payers is over $10 million dollars. Also, Mooresville has probably lost another $30 million dollars. Let’s call it what it is--a financial disaster that has a huge negative impact on the town budget. Based on my experience, these losses are likely to increase over time, and perhaps escalate due to current negative trends in the industry and intense competition. The company keeps touting their growth in customers. I have been trying for months to find out how many more customers they would need to achieve profitability. The company has said it’s too complicated to determine, but I know that is just not true. Without a plan to break even, what is the point of continuing to waste a million dollars a year on a company that has little hope of achieving profitability or even surviving! Also, tax revenues are increasing due to continuing new construction as well as rising home values. 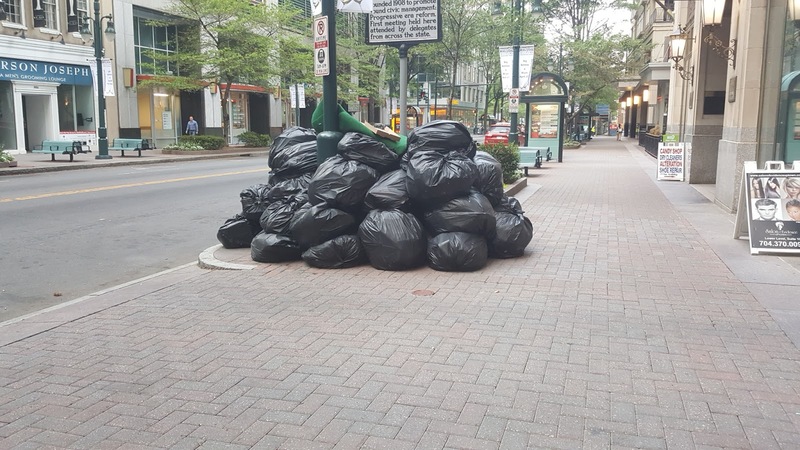 But, there doesn’t appear to be any effort on the part of the Town Board or the Town Manager to reduce or eliminate the trash fee that was imposed to cover the losses. The attitude of acceptance of these losses is quite troubling! 1. Are you going to do a detailed review of the MI-Connection status, develop a plan of action and share the results with the tax payers. 2. Are you going to ask MI-Connection for a written documented plan to achieve profitability? 3. How can you consider raising taxes to pay for a new town hall or going further into debt on a new bond issue, while wasting a million dollars a year on a company which may not be financially viable nor has a plan to succeed? 4. 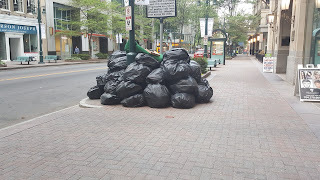 Why can’t you reduce or eliminate the trash fee that was imposed to pay for the losses? This would give the tax payers a small return on their $10 million dollar lost investment. 5. How many more years are you going to spend over a million dollars a year to keep this company afloat without a clear path to profitability? Some might say continuing on this path would be reckless and financially irresponsible! 6. Should the taxpayers of Davidson expect to lose another $10 to $20 million dollars of their hard earned money on this company? This eventuality is very concerning! It would seem this is exactly the outcome we will get without a major change in direction. Wouldn’t those millions of dollars be better spent improving Davidson? Perhaps the time has come to shut this company down, cut our losses and stop the bleeding. There are other sophisticated voice, internet and video providers in the local market today, so the existing customers would not be left without service and would very likely have lower monthly bills. 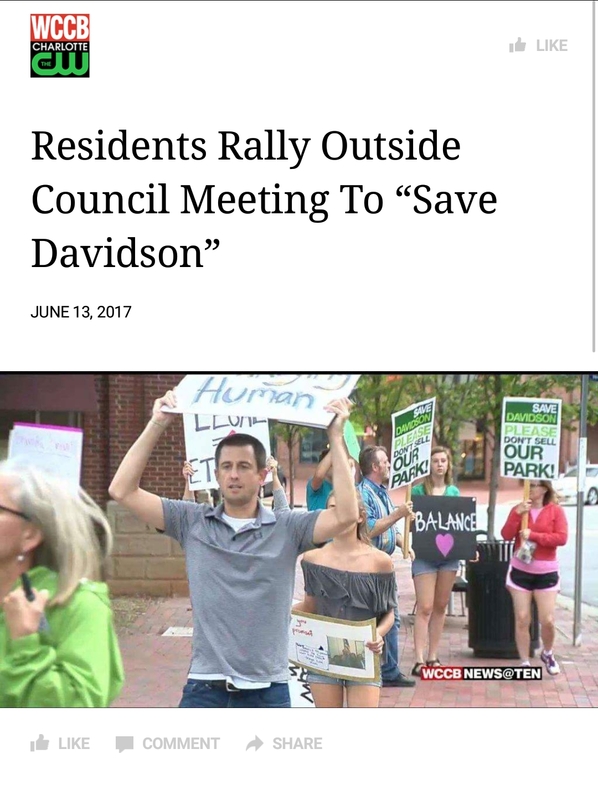 The tax payers of Davidson urge you to take decisive action and do this quickly so as to eliminate further losses to be passed on to the tax payers. Clearly, after 35 years in the business Mr Seferyn has the background to make informed comments. That's 35 years more industry experience than any of the Town's elected officials possess. So, what were the responses from elected officials? Near the end of the meeting, Commissioner Anderson, seemingly exasperated at having to even mention Mi-Connection, responded that taking Mr Seferyn's advice of shutting down the system by saying "we can't just dump it now because we'd go bankrupt". That would seem to be quite the exaggeration based on at least one faulty assumption. That assumption would be that shutting down the system would mean simply closing the doors and walking away. Obviously that's not true. Instead, shutting down the system would obviously involve selling off the assets. With the towns owing roughly $65 million as Commissioner Anderson stated, even if selling those assets only brought in 50% of that total it would leave Davidson owing $9.75 million to cover the shortfall based on its 30% responsibility for the company. That's less than the $11.5 million Davidson will have paid in subsidies through FY2018 since buying the company. All that taken together makes the claim of bankruptcy because of a Mi-Connection liquidation seem highly unlikely. On the other hand, Commissioner Anderson did allude to something that probably is accurate which should disturb taxpayers more than the false threat of bankruptcy. Anderson said Mi-Connection had taken "a couple of hits this year with competitors coming in". This is the spectre that has been out there since the beginning and was even mentioned in Mr Seferyn's comments that Anderson seemed to be trying to refute. Competition has always been the main concern from the towns' decision to enter the cutthroat telecom industry. 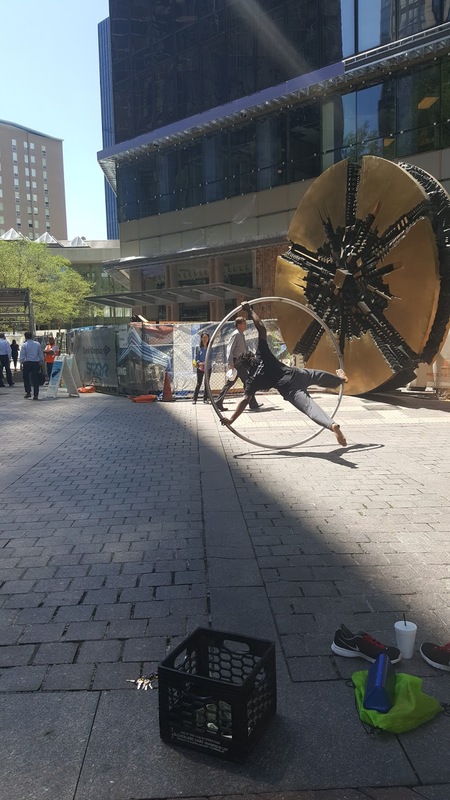 aShortChronicle recently raised questions in this post regarding the stall in the decline of Mi-Connection subsidies in the FY2018 budget. If competition is heating up and the company is taking hits, there is absolutely no reason to think that will slow in coming years. If the subsidy required stays at $1 million per year (or possibly more), Davidson may have little to lose by liquidating the company now. Commissioner Graham followed Anderson by saying he agreed with Anderson's comments and added that "the questions that were asked are the questions we do ask of Mi-Connection", but because they are in a competitive situation the Board doesn't always ask them in public. Mayor Woods, the only elected who actually voted for Mi-Connection back in 2007, chimed in with "our method is to encourage citizens to use the service." None of the electeds answered Mr Seferyn's questions, and therefore it looks like the public still gets to know very, very little about one of its largest expenses. Commissioner comments start at minute 87:15 of this video. The two CATS Express Bus routes serving North Mecklenburg will experience some changes this coming Monday. According to the "alerts" page on the CATS website the routes will change as follows starting this coming Monday, June 26th. Morning express inbound trips: Route 77X will start at the Davidson-Gateway on street park and ride lot, continue via Griffith and Main to the Cornelius Town Hall, continue via Catawba Avenue past Smithville Park, turn onto Statesville Road and continue to the Huntersville-Gateway Park and Ride lot. After the stop at Huntersville-Gateway, route 77X will continue to I-77 and travel to Uptown Charlotte. Afternoon outbound trips: Route 77X service will operate the reverse of the above. Mid-day trips: Route 77X service will operate between Uptown with a terminus at Northcross Park and Ride, making an intermediate stop at Huntersville-Gateway Park and Ride. Morning express inbound trips: On Monday, June 26th, route 48X will begin at the Northcross Park and Ride Lot. After the stop at Northcross, the 48X will enter I-77 and travel to Uptown Charlotte. Afternoon outbound trips: 48X service will operate the reverse of the above. On Wednesday, July 5, 2017 Route 48X Huntersville Express will be extended to the new Cornelius Park and Ride Lot at 20300 Sefton Park Road. Customers will be able to park at either the new Cornelius Park and Ride at 2033 Sefton Park Road or the Northcross Park and Ride starting on Wednesday, July 5th. According to a CATS representative at the Uptown Transit Center Wednesday, schedules with any time changes will not be available until Friday so if you ride either of these routes pick one up then. Davidson has another RFP underway, but unlike the Beaty Street RFP which has caused a lot of controversy, this one hopes to address an issue many (maybe even most) can agree on - Mobility. The Mobility Plan RFP was posted to the town website with a date of June 12th. Responses are expected by June 30th. 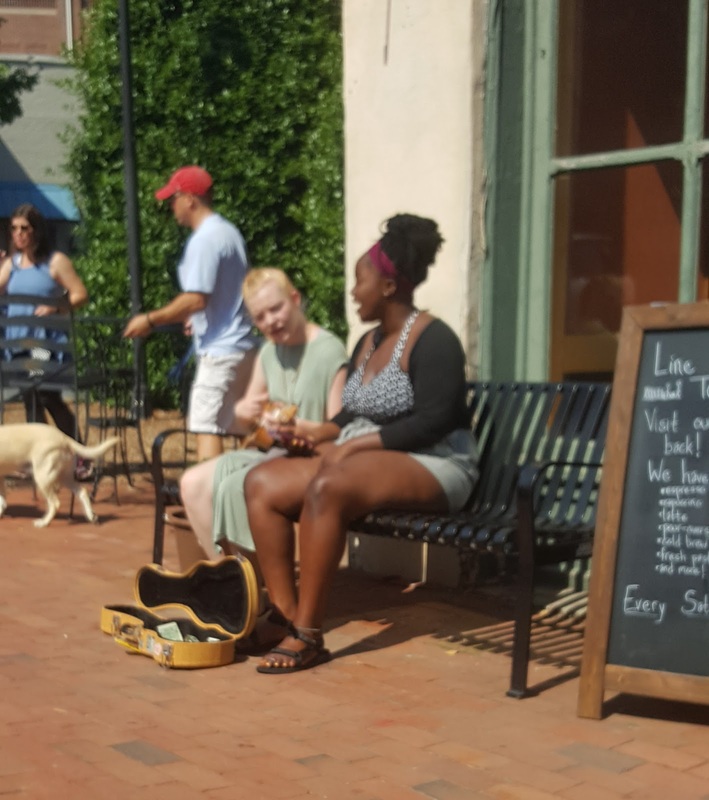 While Davidson has done a lot of mobility related studies in recent years including the Walks and Rolls Plan and various downtown parking studies (3 since 2011 by aShortChronicle's count), this RFP is for putting together an overall guide around mobility similar to the Town Comprehensive Plan. 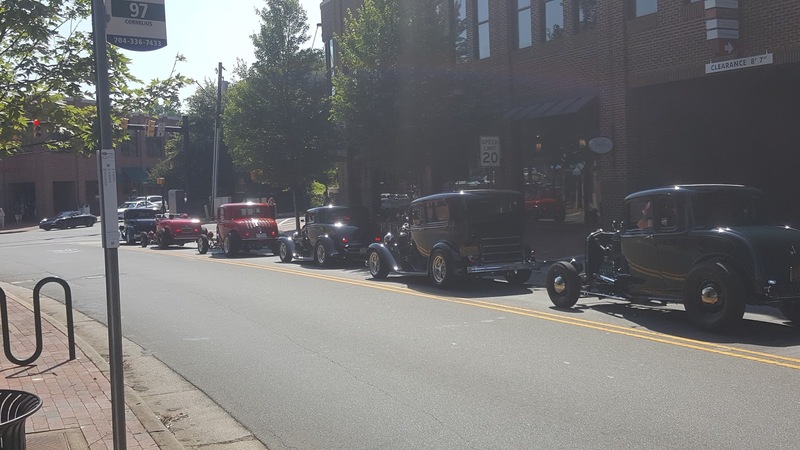 "The Davidson Mobility Plan will propose transportation enhancements, programs, development policies, and projects to enhance connectivity for all modes of transportation in town. This plan will also evaluate and incorporate traffic management strategies / programs, evaluate car / bike sharing programs and investigate other innovative transportation solutions. This plan will serve as Davidson’s comprehensive transportation plan and be used as a guiding document for mobility as the town grows. Projects recommended as a result of the Davidson Mobility Plan will be prioritized and funding will need to be determined and allocated." "no firms received the Davidson Mobility Plan RFP directly. It was listed on the NC Planning List Serv, the town’s website, and Charlotte's RFP website." As for a tentative timeline for vendor selection, the Town "will select a vendor 2-3 weeks after receiving the applications. This may change depending on the number of applications received and NCDOT timelines." As is typical for Davidson, the plan covers way more than automobile mobility. As a nod to that fact, the order of the sections in the requested response is as follows: Pedestrian Mobility, Bicycle Mobility, Mass Transit, Roadways, Parking. 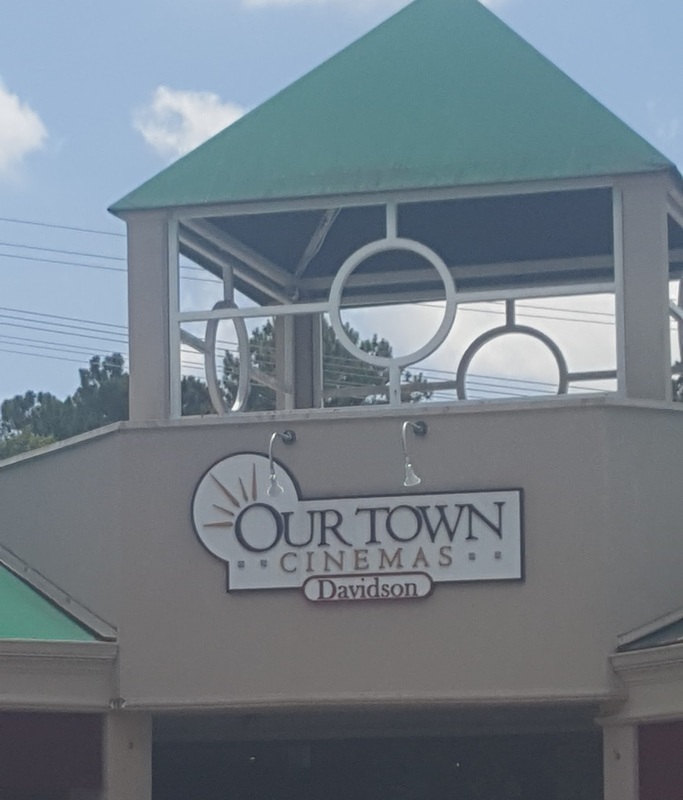 Davidson has a long history of spending money on things of questionable value for the town. While the overall concept of a Mobility Plan seems like a good idea, this last section provides ample opportunity for that unfortunate tradition to continue. Can anyone else hear Davidson Commissioners justifying "infrastructure inspection robots" or an "unmanned aircraft system" to monitor the Town greenway network? As with all of these types of things, Davidson says it wants lots of public input and the RFP requires input sessions and input from stakeholder groups as part of the plan buildout. However, as has been seen with the Beaty Street RFP, saying the Town wants public input and listening to and accepting that input can be very different things. Davidson's Design Review Board will hear a proposal this Wednesday to expand the Our Town Cinemas at Sadler Square as part of a small expansion of the shopping center on Griffith St just off Main in downtown Davidson. 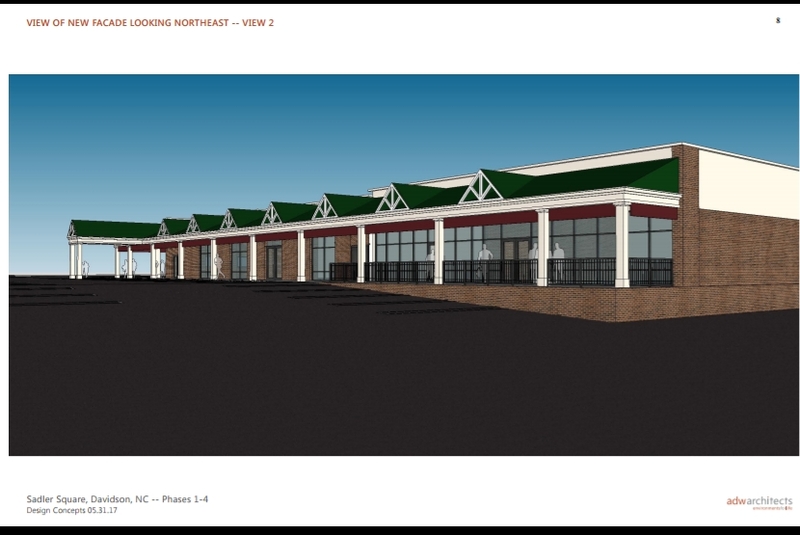 The plan proposed by ADW Architects would expand the theater in both directions to include the entire west side of the shopping center. 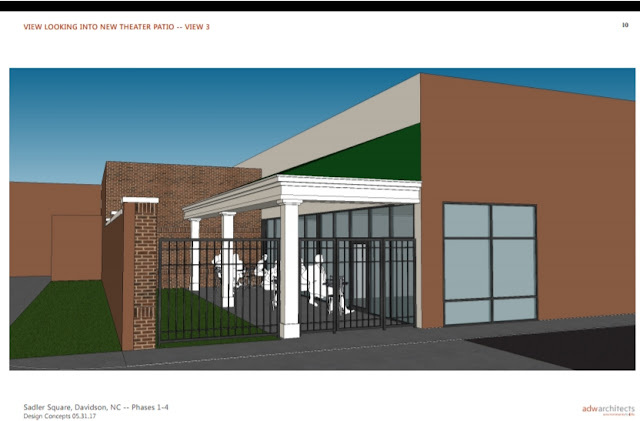 According to the application, the nail spa and kitchen and bath design store would move to new spaces constructed on eastern side behind the dry cleaners and facing Waton Street. See the below schematic for a layout. 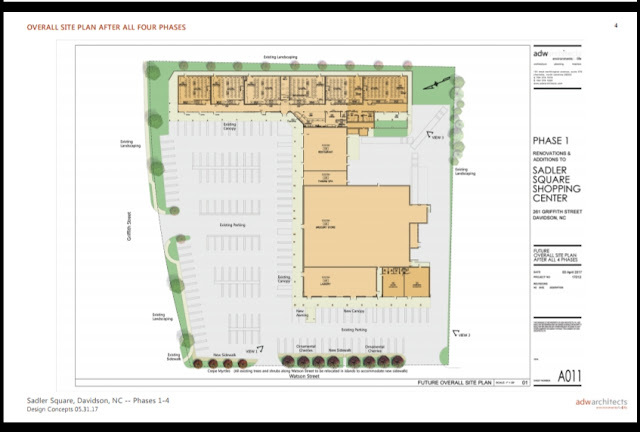 The project would happen in 4 phases to enlarge the theater and concession area towards the back of the shopping center, build the new retail space facing Watson St for the existing tenants, then finshes off with more theater space after the existing tenants move to their new spaces. Here are some elevations of how the new space would look. aShortChronicle contacted Bob Lauer of ADW to verify details for this post. Lauer is a principle with ADW Architects. He also is involved of the operation of Our Town. Lauer chairs the DRB, and as such he will not be voting on this proposal. The DRB meeting is Wednesday 7pm at Town Hall. It's a nice place to visit, but..
Uptown Charlotte can be an interesting place. Unlike some who don't ever enjoy heading into the city, yours truly doesn't mind it at all. I particularly like the "randomness" of it. It's stuff you don't see every day, and it's interesting. 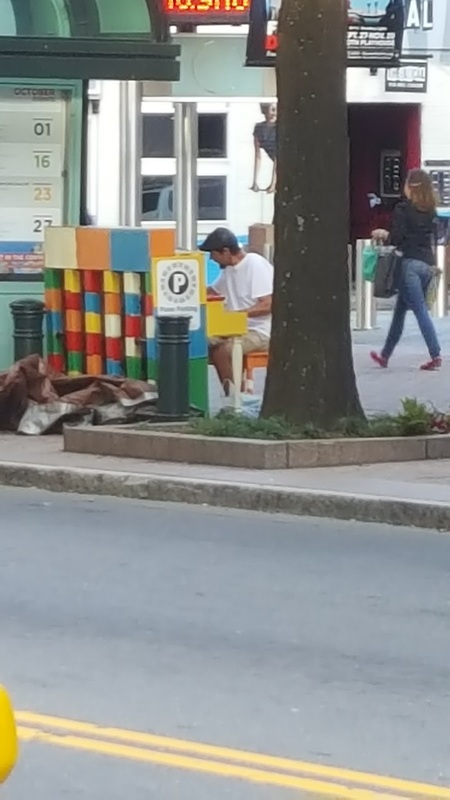 piano left on the street. Then I get to come home and enjoy what Davidson has to offer. 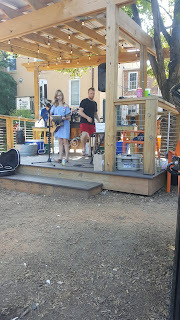 They are different places for a reason, and while Uptown Charlotte is a nice place to visit - as the saying goes - I wouldn't want to live there. So, for the life of me I can't understand why the leaders of "official Davidson" don't seem to get it. They seem shocked that people are upset, even angry, over what is happening with development and how fast it is happening. 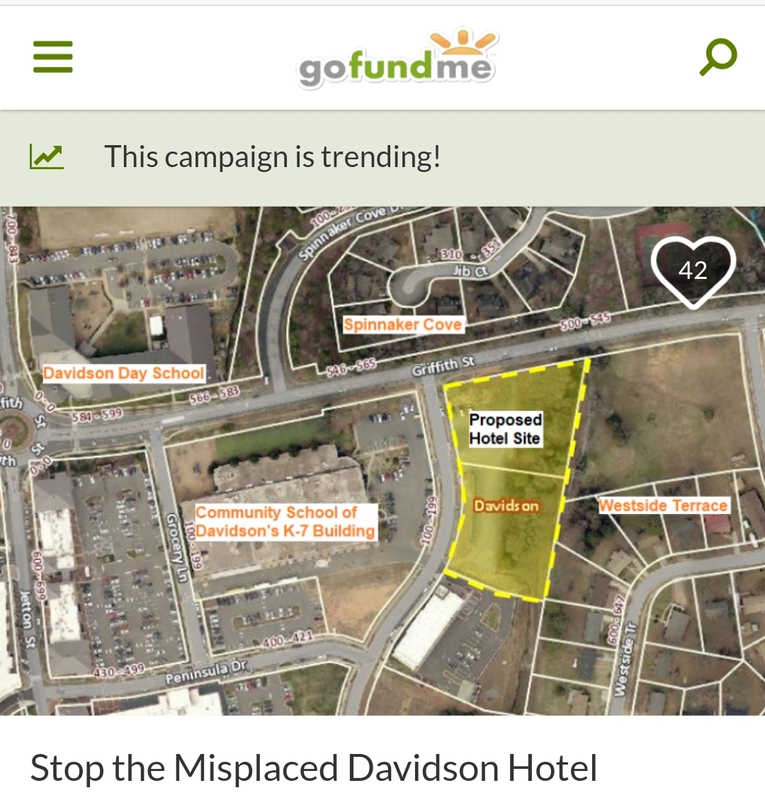 Even more so, people are shocked at Davidson Town Hall being a facilitator, even instigator, of these changes (Catalyst Project, Griffith Street Hotel, RAP mass rezoning, Beaty Street RFP). People are tired of the condescending retorts about NIMBies or people wanting to pull up the drawbridge to keep people out when it comes to ideas emanating from Town Hall. 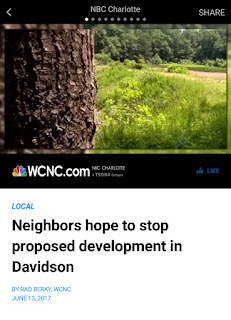 Instead, the public wants a laser focus on protecting what Davidson has to offer rather than a seeming desire to make it into a mini Charlotte. The people living here now who are fighting these changes, don't ever want to say about this town, "it's a nice place to visit, but...". Instead, they want to just want to make sure they can say, "it's a nice place to live". aShortChronicle told readers last week about a proposal by the Davidson Police Department to install cameras and licence plate readers around town. On Tuesday the Board passed a slightly scaled back proposal to do just that. The proposal will place cameras and licence plate readers at the "ingress and egress" points around town which will allow the DPD to know who is coming and going to and from town whenever there is a crime. The original proposal also involved a few cameras internal to town, but those did not make the cut. Here's the dollars and cents as presented on Tuesday by Town Manager Jamie Justice and Finance Director Pietre Swart. The bulk of the funding comes from the existing FY2017 DPD budget as well as FY2017 contingency funds set aside by the Town for just such things that come up during the year. Only $20k is being pulled from the town savings (aka fund balance). During Commissioner comments, Commissioner Graham referenced the recent break in off Davidson Concord Rd as an example where this tool could be useful, noting its ability to let investigators know who is entering town at 4:30 in the morning. Commissioner Fuller, who had initially expressed reservations with the cameras when the idea was presented in May, relayed that after having met with Chief Miller and senior DPD members, Steve Ingram and Jay Stokes, he had changed his opinion and had his civil liberties concerns largely addressed. After Commissioner Fuller motioned to approve the camera budget amendment, it passed unanimously 4-0 with Commissioner Cashion absent. No date for the project implementation was set. Fellow citizens of Davidson. After all the shenanigans at town hall over the last few months, I simply cannot take anymore. I have decided to run for Commissioner of Davidson. My platform can be distilled to "Transparency and Trees." 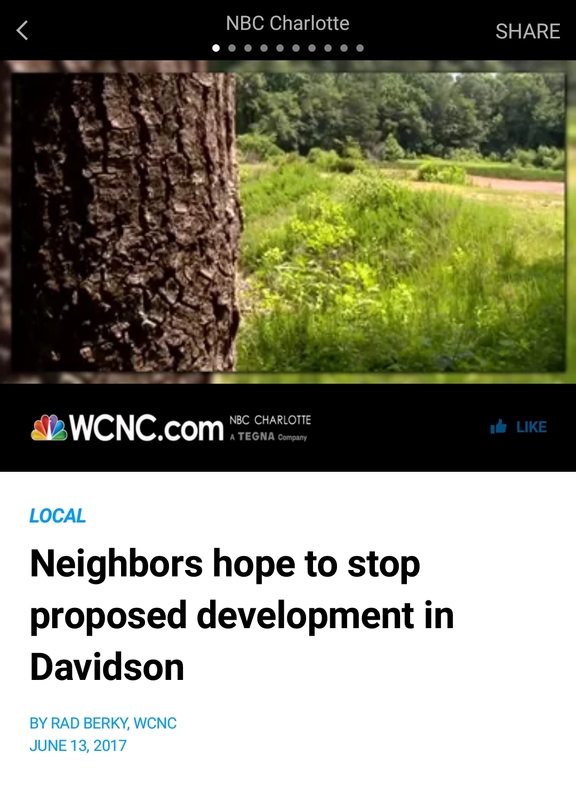 The sudden explosion of growth around Davidson will ruin our town if we do not continue to take steps in preventing the development of every parcel of land. The citizens of Davidson deserve their voice to be heard about the new Town Hall so funding MUST come from a bond referendum. The wishes for Beatty Street MUST be upheld. The apartment building on Potts street MUST be stopped. The Town MUST find a way to get out of the money draining MI Connection. NOT someone who would benefit from growing residential housing. I am a retired Army veteran that adopted Davidson as my home town when my wife and children settled here during my deployment to Iraq. They remained here while I finished the last 7 years to retirement in 2011. I fell in love with this town and am determined to keep it from becoming over developed. Thanks for those of you who supported me two years ago. We were very close to removing one tou the commissioners. This is the year we start to take back our town. Angell makes some strong statements in this announcement that likely ring true with many voters - covering several hot button issues. What is unsaid is that the commissioner who Angell came closest to removing last time was Commissioner Brian Jenest. Commissioner Jenest's firm also happens to be involved in the Potts Street appartmemts Angle mentions specifically. Could that be a first shot across the bow this election cycle? We will have to wait and see, but with filing just around the corner we won't have to wait too long. The Town of Davidson is pleased to name Penny Dunn as the new Davidson Police Chief to replace Jeanne Miller upon her retirement. Dunn will start on July 19th. The Town of Davidson conducted an eight-month nationwide police chief recruitment process with the assistance of consultant U.S. ISS. We held meetings with over 50 community members, the board of commissioners, the police department, and staff to develop a comprehensive departmental profile to outline the type of person we were seeking for this role. We received 110 applications, and with the help of staff and our consultant, narrowed the field to three finalists through interviews and assessments. In May, the town held a comprehensive two-day assessment center consisting of community, professional, police, and staff interview panels. Penny Dunn started her law enforcement career in 1986 and has served with the San Marcos (Texas) Police Department since 1989 where she currently serves as assistant police chief. Dunn’s experience in law enforcement includes work in several areas including criminal investigation; day and night shift and specialized unit (including the K-9 unit) command; narcotics; employee recruitment; and cold case investigation. Dunn received her bachelor of applied arts and sciences from Texas State University and became a Certified Public Manager in 2011. Dunn has been recognized for her public service by receiving numerous awards. Davidson Town Hall and the ongoing swirl regarding the Beaty Street RFP drew some serious media coverage yesterday. In fact, more coverage than for anything in recent memory. 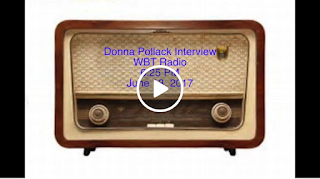 Here is an interview with Save Davidson activist Donna Pollack on WBT radio during the evening drive. There were multiple TV crews on hand as well. So, Davidson finally has its first candidate for the Board of Commissioners race this November. aShortChronicle has been periodically asking the incumbents if any of them plan to run for reelection, and so far none have taken the opportunity to commit one way or the other. Today however, the race officially started with political newcomer Sammy Weaver announcing his candidacy on Facebook Tuesday morning. Hello, my fellow Davidson Citizens! Thank you for this warm welcome. I am very happy to be here with so many new friends! I am here today to announce my intention to seek one the nominations for Commissioner of the Town of Davidson. Over the next few months, I will challenge myself, go out into public, speak and introduce myself to as many Davidson residents as possible. I will listen and more importantly, pay attention. And for the ones who have been more vocal than others, I HEAR YOU LOUD AND CLEAR!!! All I ask from you is to continue to be LOUD and maybe, maybe someone will hear. I know I will. I am here to serve the community and ONLY the community. I wanted to be brief but here are things that I am and are NOT. I am a Davidson Resident. This slogan is very important to me; it isn’t about anti-development or against growth. 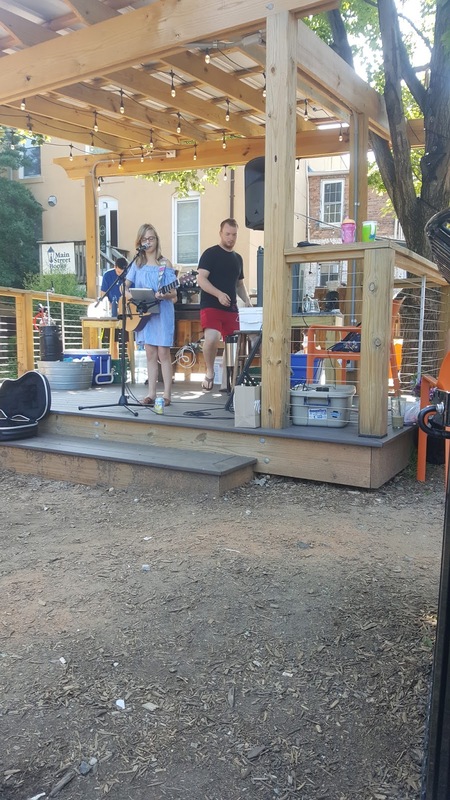 It is about establishing roots within our community, our home the Town of Davidson, and slow but important growth (similar to an Oak Tree) that benefits the community as a whole and not my self-interests (Roads, High Density Development, Compromising values, etc.). startled Stay Tuned for more information “On the Issues” and how we will address them together. Official filing begins on July 7th at noon. Organizers with the Save Davidson Facebook page have sent out the following press release. WHO: Davidson citizens are planning to protest, calling it “Save Davidson March for Ethics,” to continue voicing their objections to the town commissioners ignoring a 1985 signed agreement to make the Beaty Property a park. WHAT: Citizens’ primary concern is that the town board will vote on June 13 to move forward to develop Beaty Street Property. Citizens view this as a violation of an agreement the town made in 1985 with Mrs. Venie Clontz. In a new development, it has come to light that a private entity donated property to the Town when the Hobbs Hill neighborhood was developed. According to an e-mail from the private entity to the mayor and town manager dated April 19, 2017, these parcels were donated as a condition of the Hobbs Hill I & II Subdivision approval by the town. The parcels were required to be given to the Town as 1) a buffer against future development along this portion of Beaty Street and 2) to interconnect to a future park within the adjacent pond site. Considering two different entities provided land for park and buffer purposes, is it ethical for the town to now develop those properties? 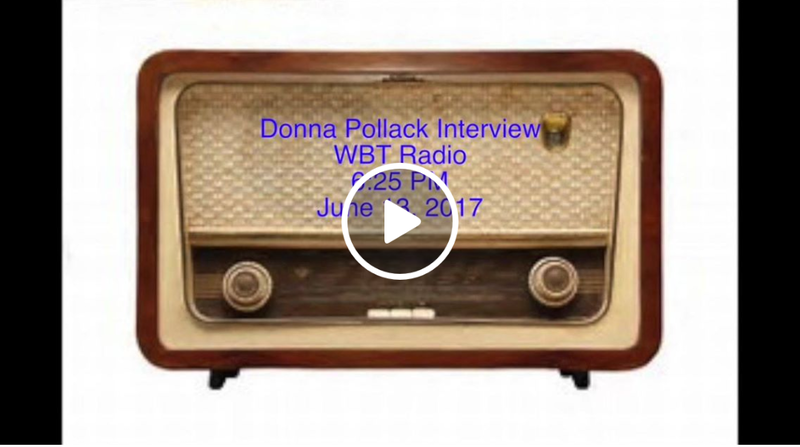 WHEN: 5 to 6:30 p.m. Tuesday, June 13, 2017. This is the evening that the town board meets. WHY: It’s a violation of trust if the Board chooses to proceed with this development process now that it is aware that it directly conflicts with the agreement with the seller 32 years ago. The Town owns the land, not developers. 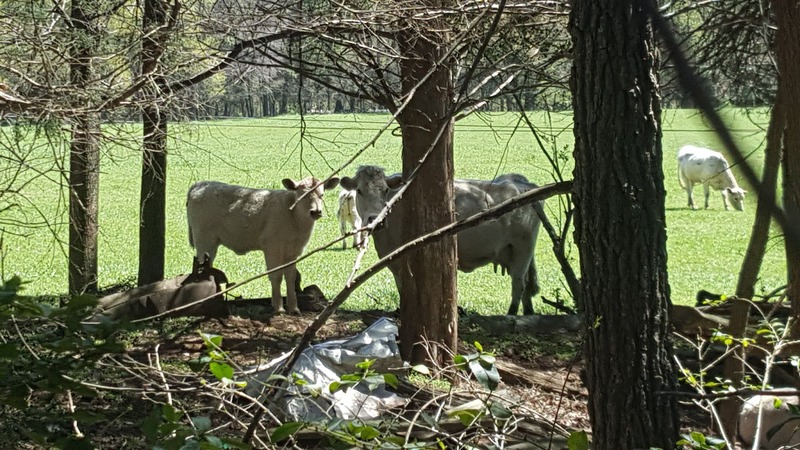 A Mecklenburg County Park and Recreation commissioner cautions about the loss of town-owned land to development considering projections for growth in the region. After numerous documents have come to light (we can provide these to media) citizens are concerned the town is not keeping its word. Added to that is concern about adversely affecting water and air quality, traffic flow and overall quality of life, particularly considering a major development just north on Highway 115. 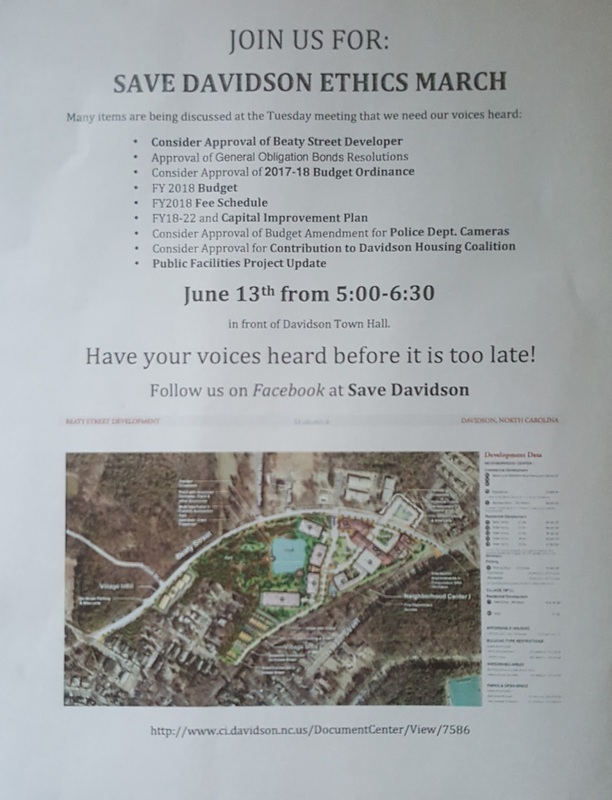 UPDATE: Davidson Town Hall sent out an updated agenda this morning just before 10am that did not include a vote on the Beaty Street Property. A previous agenda as of 3pm yesterday still had tjis included indicating something possiy happened in the overnight hours to cause this to change. While this is seen as a step in the right direction by activists, per the Save Davidson group this has no impact on the planned march. As Davidson electeds sit down Tuesday for a meeting full of critical long range decisions, they will be greeted by a good old fashioned protest. Recent meetings have been packed with opponents of various plans, but protesters on the picket line is definitely a rarity. 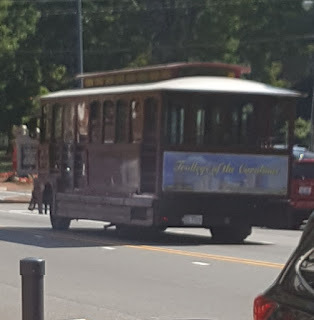 Volunteers with the Save Davidson Facebook group have been hard at work getting the word out over this past weekend with the "magnet mobile" pictured above parked on Main Street most of the past three days and a flyer handout across town. On Tuesday, all of that will result in a march on Town Hall. Bonus Observatiin: Commissioners will be making these critical long-term decisions and at this point, none of them have officially announced whether or not they plan to seek re-election. That means they could be making these decisions as "lame ducks" who won't have to face the voters. Filing is in mid-July. As Chief Miller retires, will Davidson Commissioners support DPD camera request? Starting off the meeting, the Board will recognize long-time police chief Jeanne Miller. Miller is retiring this month. She has done an great job over the years leading the department, and she will be sorely missed both around Town Hall and, on a personal note, around the Bradford neighborhood. Yours truly has been neighbors with the Chief since moving to town and my family and I are sad to see this day finally arrive. A reception for Chief Miller starts at 4pm Tuesday at Town Hall. 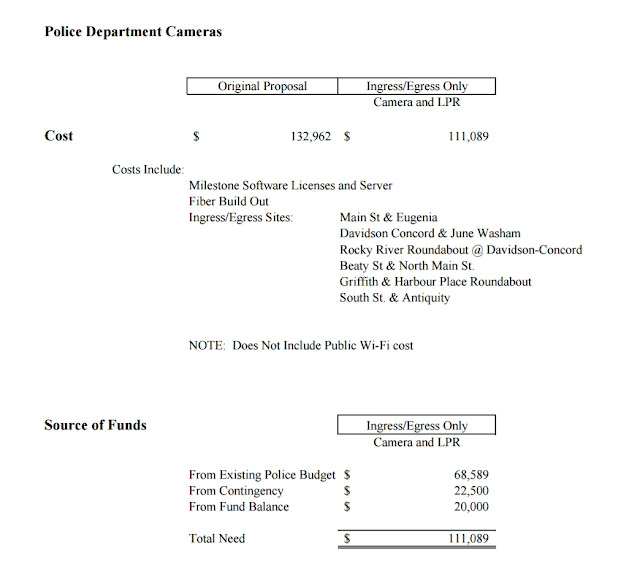 Bookending the meeting is a second agenda item that is a priority for DPD - a $20k budget amendment from the Town fund balance plus just under $30k from the 2017 contingency fund before the end of FY2017 to start funding a digital camera system around town. The DPD has been talking about a system similar to what Mooresville and Cornelius already have in place for a couple of years now. The full proposal would involve 11 cameras installed around town with 7 of them including licence plate readers. The full cost of the system would be about $153k plus annual monitoring. While some may have concerns over such a system from a civil liberties point of view, the plan is to only have the system used as an investigative tool Esther than an actively monitored system. Readers, should also be reminded of the value of these tools. From speaking with those familiar with how these systems work and who have seen them in action, they are pretty awesome in narrowing the scope of an investigation quickly. The Davidson homicide in 2015 was solved quickly in large part because the perpetrators' vehicle was captured on the Cornelius system. One has to wonder if last week's burglary in Davidson which left the town uneasy might have been resolved immediately if the requested system had already been in place. It is a bit of a pricey system, but Davidson Commissioners seem to be able to find the money when it's really important to the town. 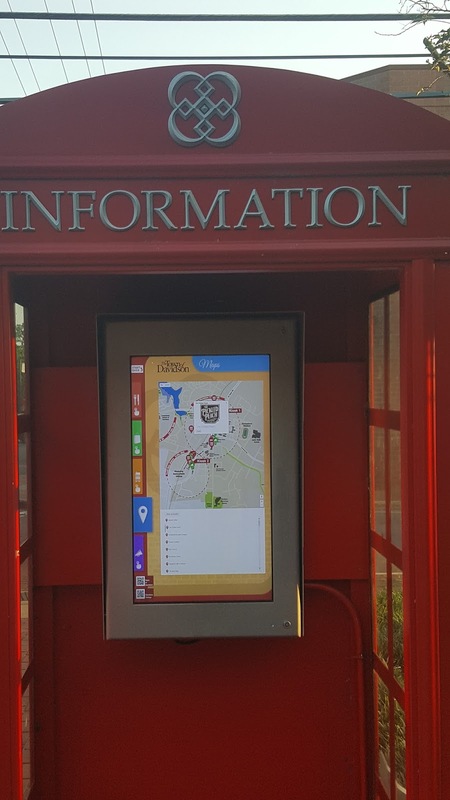 For example, they coughed up a hefty sum for the two "information kiosks" on Main Street. Even though the one at South Main Square seems to be broken a lot of the time, having this at the entrance to town probably comes in handy for a few people (when it's working). contributes to the town core values of protecting the environment. 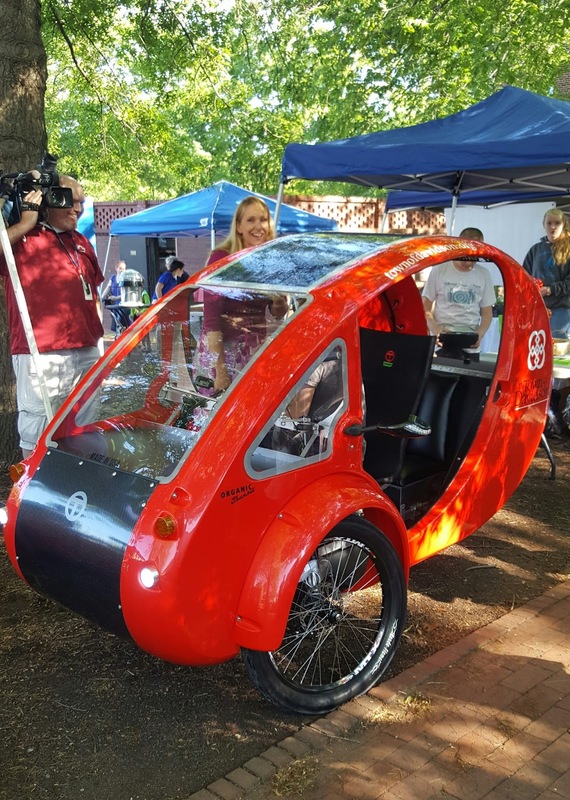 The town "ELF" is rarely seen plying Davidson streets, but when it does get used at least there are zero emissions. Ok, all kidding and sarcasm aside. Considering these things made the cut as reasonable expenditures according to this same group of elected officials, then surely something that benefits public safety will bubble up to the top of the priority list. In about a 10 minute span all of the following were seen on Davidson's Main Street Saturday morning. This was at least 30 cars long. and a trolley roaming the streets. 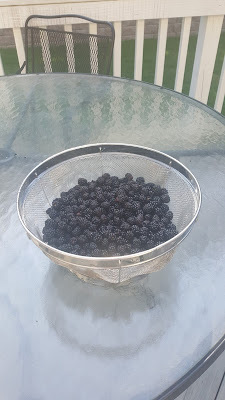 All of those things plus the Davidson Farmers Market made for an awesome morning in town, but that small town charm is under intense pressure. That pressure makes this last picture maybe the most important. The "Save Davidson" magnet mobile. 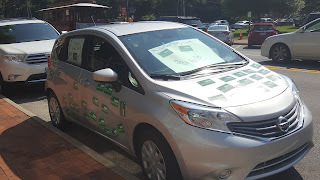 Pick up a magnet when you see this car around town and join the Save Davidson Facebook page to see how you can help. aShortChronicle told readers a couple of weeks ago about the possibility of Davidson Commissioners putting a sizeable amount of $$$ up for a vote on the town's first ever General Obligation bond. At the May 23rd Board meeting they took a major step closer towards doing that. Before getting into the details, readers need to remember this money is not for the truly big ticket item of a new Town Hall and Public Safety facilities. The Board won't let you vote on that. Instead, that will likely depend on a 15% stealth tax increase at the next property revaluation in 2019. These bonds are for other things. By one Board member's own description, items more appropriate for a GO bond vote include items that are "nice to have, not critical services." While aShortChronicle wholeheartedly disagrees with this limitation everyone is entitled to their own opinion. However, it should be pointed out that by the logic most Davidson Commissioners appear to be using, schools would never go up for GO bonds, neither would roads. Many people, probably most, would consider those critical services by government yet citizens regularly vote on them. 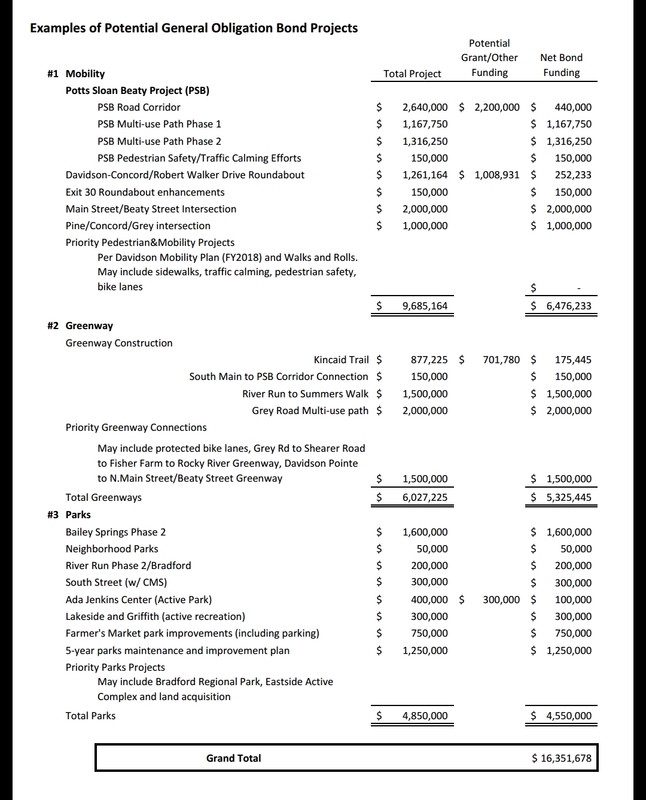 At the May 23rd meeting Commissioners instructed staff to prepare a $15 million bond this November for what can best be described as primarily mobility projects. However, in true Davidson style "mobility" doesn't just mean roads. This bond order to be voted on at this coming Tuesday's meeting will be broken up into three parts - transportation, greenways, and parks. Here is the bond order language for each part. aShortChronicle confirmed with the Town that if approved by the Board, this should end up as three different ballot questions in November. That's a good thing as it won't be a single "take it or leave it" $15 million question. However, based on a review of the proposed projects, Davidson Town Hall appears to be starting off on the wrong foot by deceptively grouping these projects under the above categories. 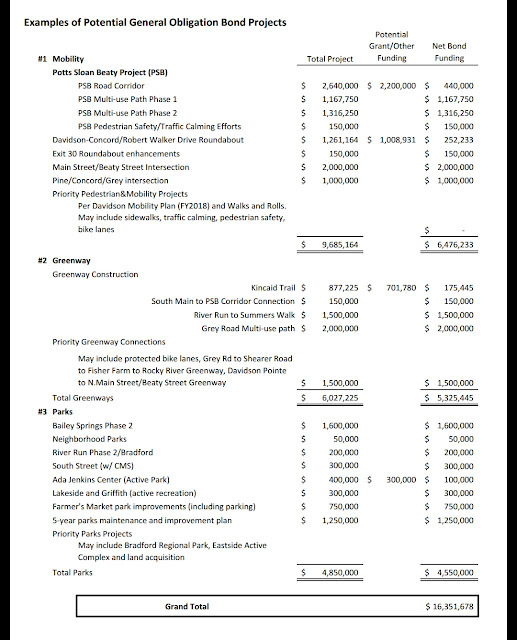 Looking specifically at the $6 million Mobility category, there are 2 projects worth just under $2.5 million that are for Multi-Use Paths related to the Potts Sloan Beaty road project. The rest of the listed projects with dollar amounts are roads. The multi-use path projects, if the Town was interested in being transparent, should be under the Greenways category. 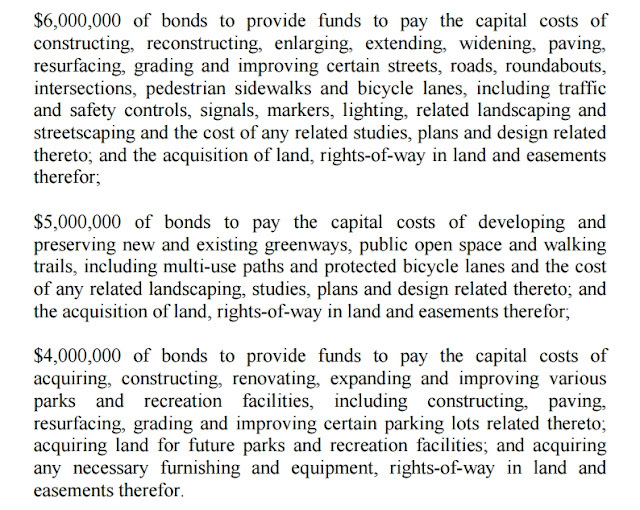 As proof of that, look at the language in the above $5 million bond order for greenways. It specifically says "multi-use paths" as one of the allowed uses. 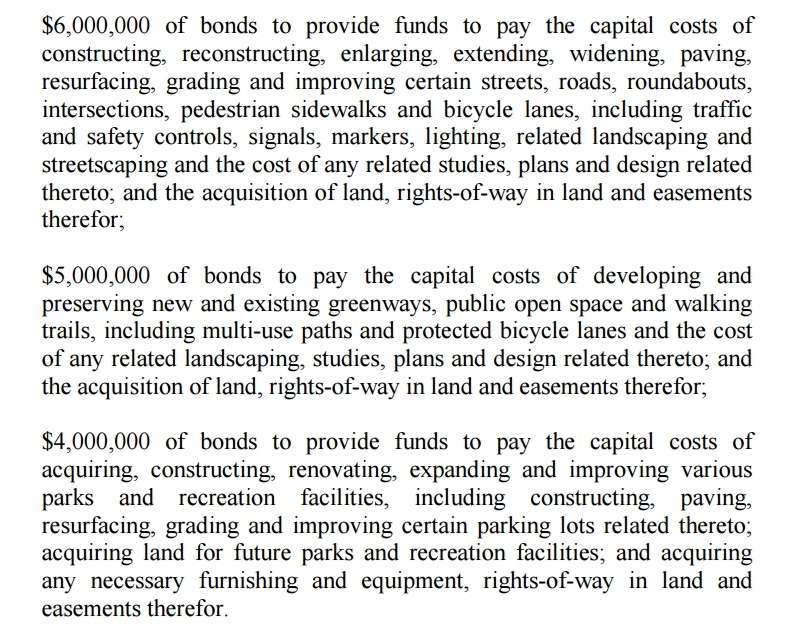 Again, if Davidson Town Hall had any interest in being transparent it would recategorize the bond orders to be $3.5m for Roads, $7.5m for Greenways, and $4m for Parks. Why do you think that is not being done? Do you think these bonds have a better chance at passing if people think Town Hall is asking for more money for roads or for greenways? The way they are presenting it, it appears they are spending more on roads. The reality is that much, much more will go to non-road transportation projects - by more than a 2-1 margin. In fact, 41% of the money in the category that looks like roads is actually for non-road projects. We can certainly debate which is better for Davidson, but let's at least debate it honestly. The agenda for the next meeting of the Davidson Board was published late Friday afternoon. It contains an item titled: Consider Approval of Beaty Street Developer. In government lingo "consider" means "vote". 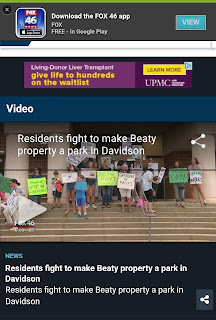 This comes just 3 weeks after the most watched episode in Davidson Town Hall history where Davidson Commissioners heard from both their former Town Attorney and the grandson of the property owner who sold the majority if the Beaty St property to the town over 30 years ago. Since then a steady stream of documents have been released by activists confirming the intent of that sale for the land to be used as a park. There have also been documents showing the Town working with the developers to "drum up" more support for the project known as the Luminous. At the end of the previous discussion the Board asked the developer to come up with a few changes. Those are included in the agenda. Will these incredibly modest and ambiguous changes be enough for Commissioners to vote the proposal through with straight faces? We will find out Tuesday. One thing is certain however. For opponents of the project, this skimpy list almost certainly will not be enough to appease their discontent. Update: Organizers tell aShortChronicle a protest is being planned for Town Hall immediately prior to the Tuesday Board meeting. Stay tuned for more details. aShortChronicle followed up with the Town of Davidson on Thursday regarding the early Tuesday AM incident involving three burglary suspects. Residents were contacted by the town Tuesday morning via email, text message, and social media regarding an incident. 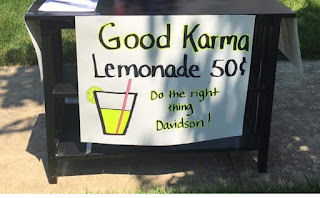 "On Tuesday, June 6 at approximately 4:27 a.m., the Davidson Police Department received a call reporting a burglary of a home in the Page’s Pond neighborhood off Davidson-Concord Road. Officers responded as the three suspects were fleeing the scene in a vehicle. Three suspects, all wearing ski masks, crashed the vehicle in the McConnell neighborhood on Morrison Hill Road. One suspect is a black male who knocked on the door of a home along Grey Road, claiming he had been robbed. When the homeowner said he would call the police, the suspect fled." At 9:24 AM a text message for subscribers to the civic alert system arrived. The word was also put out on Facebook and Nextdoor. "We believe the three suspects have fled the area and that there is no immediate threat to Davidson residents related to this investigation." While it was certainly a relief to hear the update, a few residents did raise questions on the Nextdoor social media app as to why the initial communications did not go out earlier considering the location and that it was a school day. Thursday afternoon, aShortChronicle heard back on a request to see if there was any more information such as if the vehicle involved was stolen. Here's the latest from Public Information Officer, Christina Shaul. "The investigation is still underway. Our police department is actively seeking suspects, and we are pursuing every lead based on evidence as it arises. At the moment, we are unable to comment about the status of the recovered vehicle, beyond the fact that it remains a critical piece of evidence to our investigation." 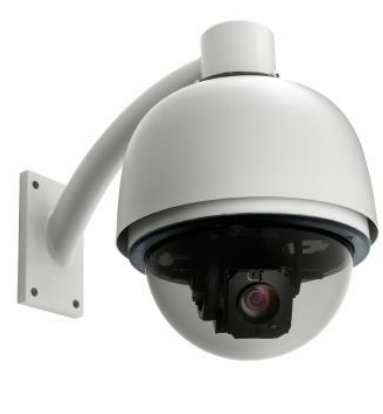 If you have any information, including home security video, please contact Detective Jay Stokes at the Davidson Police Department at 704-892-5131.
aShortChronicle is usually more on top of these things, but every now and then something slips by the information dragnet. That happened last week when we missed an important email that went to an infrequently monitored email account. For that we apologize to our regular readers. 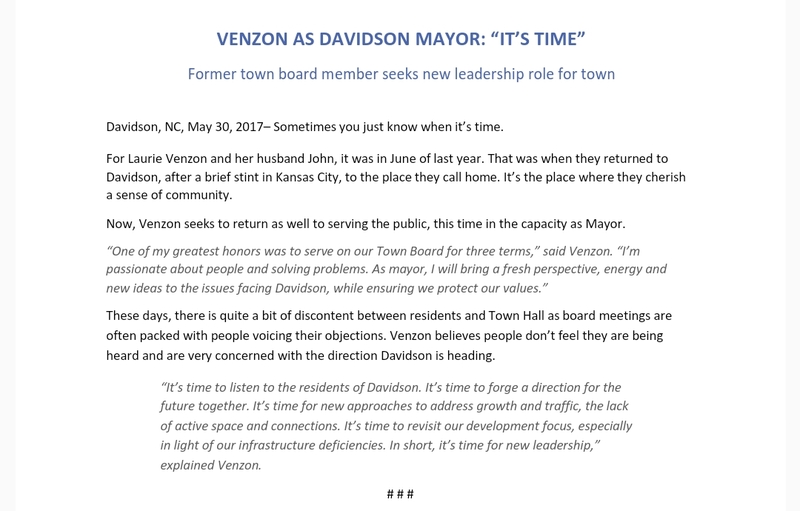 On Tuesday May 30th, former Davidson Commissioner Laurie Venzon issued the first public announcement of her campaign for Davidson Mayor at the November election. That makes her the third candidate to say they will seek that office, the others being Rusty Knox and current mayor, John Woods. Official filing doesn't start until mid-July, but having three people seriously talking about running for Davidson Mayor certainly makes this upcoming election cycle interesting. Here is what the announcement from the Venzon campaign had to say. 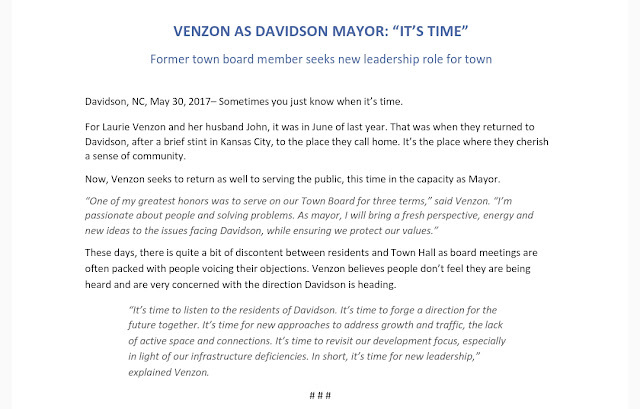 Venzon's announcement shows she is keyed in on the issues that have riled up residents over the past few years. It's good to see her previous experience on the Board didn't leave her with a bad case of the tone deafness that seems very contagious around Town Hall these days. aShortChronicle first let readers know Venzon was likely to be a candidate in this story back in February. Venzon filed paperwork with the Board of Elections back in November 2016 and raised about $2500 before year end. The next round of campaign reports won't be out until late July. Venzon looks to be puting together an experienced campaign team. Her campaign treasurer is listed as Brenda Kolls of Davidson, and Venzon confirmed for aShortChronicle that she has also hired local political consultant Neil Orr as a "campaign strategist". This is the same pair Commissioner Beth Cashion used for the same roles when she ran for the Board in 2013 where she was the top vote getter. With this announcement, things are shaping up to be a real horse race in Davidson this November. You can check out her campaign website at laurievenzon.com. The Tribune article outlines some of the details in the back and forth between Atkins and Coble, but not all. Coble showed clear disdain for those most impacted by the potential Mooresville project, primarily Davidson residents. When caught, he gave a weak apology. However, not only did Coble insult residents, Atkins got in on the game as well - a fact the Tribune article conveniently left out. During the exchange, when asked if he'd seen one particular email from a resident discussing possible legal action, Atkins responded with this. Maybe the crying kitty emoji is a sign of sympathy, but that seems unlikely. The rest of the text exchange shows how Mooresville is planning to respond. There are mentions of interviews with local mainstream media including the Charlotte Business Journal and the Charlotte Observer. They discuss how the elected Town officials should respond to these requests. The answer is to say as little as possible and hide behind the idea they are just trying to be fair to the rezoning request. Both of them indicate they have no interest in a delay. They must have changed their mind when the hornets showed up to pack Mooresville Town Hall Monday night because delay is exactly what they did. What kicked that nest? Here's the first text in the overall thread. Glad to see Mayor Atkins is a reader of aShortChronicle. 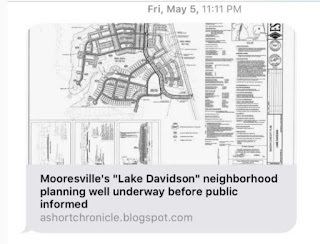 Yesterday, aShortChronicle told readers about tonight's hearing and vote on the massive Lake Davidson neighborhood rezoning request. As part of that we mentioned the possibility of pursuing a move towards conditional zoning instead to give citizens more control. 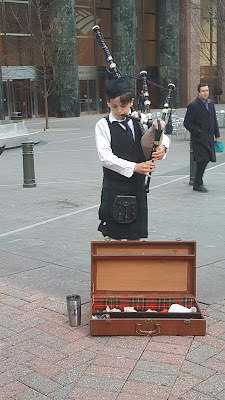 Well, a petition has just started on Change.org with outlines a whole host of legal issues against the rezoning - including moving this to conditional. The tone of the petition sure sounds like this one is headed to court if tonight's decision doesn't go the right way. This certainly amps up the drama for the hearing. The action starts at 6pm at Mooresville Town Hall. Here at aShortChronicle there isn't a huge emphasis on readership. The mantra has always been it's more important "who" reads than "how many". However, periodically we see spikes in the number of page views that warrant taking notice. The month of May completed this past week was one of those events, or more accurately May included a series of those events. 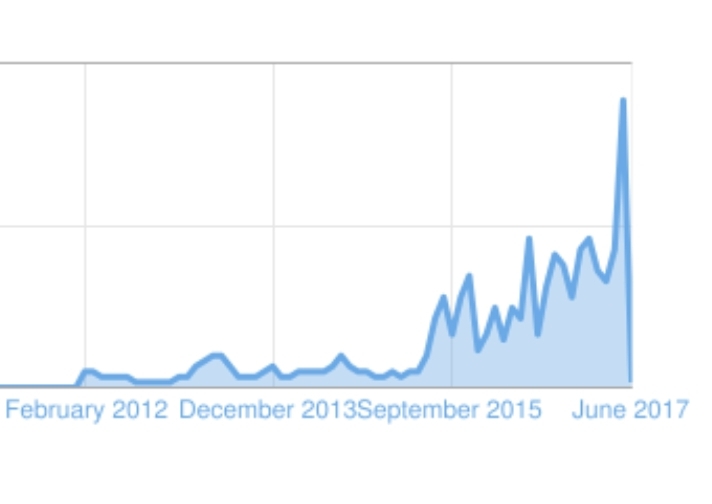 Here's the monthly chart since the blog began over 5 years ago. It doesn't show the total numbers because, well, it's always good to keep Town Hall guessing and on their toes. However, let's just say even before this past month, readership had grown way bigger than ever expected - a fact that surely makes some blind faith Town Hall defenders cringe. So what happened in May? Stories about development happened. That's what. Three of the blog's all time top five posts happened in May - all about development related stories. 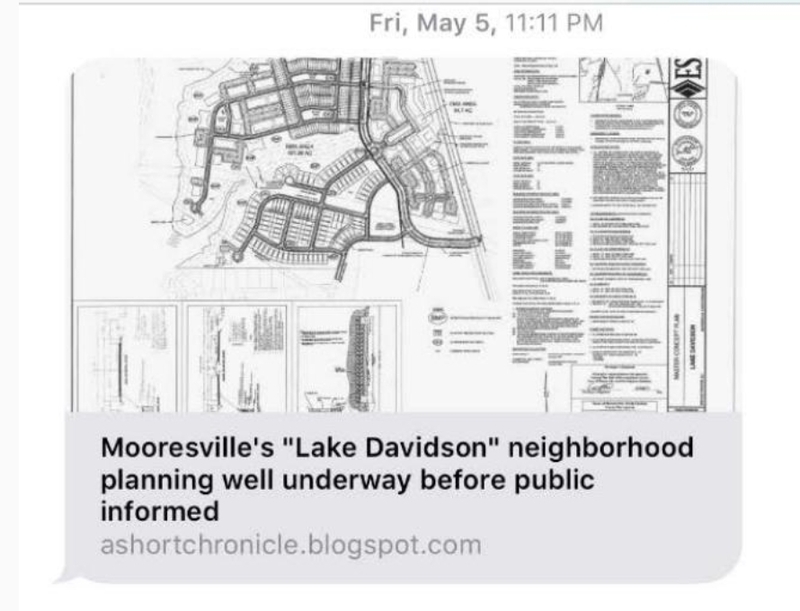 The story about Mooresville's Planning Board public hearing on the proposed Lake Davidson project rocketed to the all time #1 spot getting nearly 6000 page views. The recent story about the Beaty Street project involving "lawyers, threats, and karma" now sits at #3 all time. 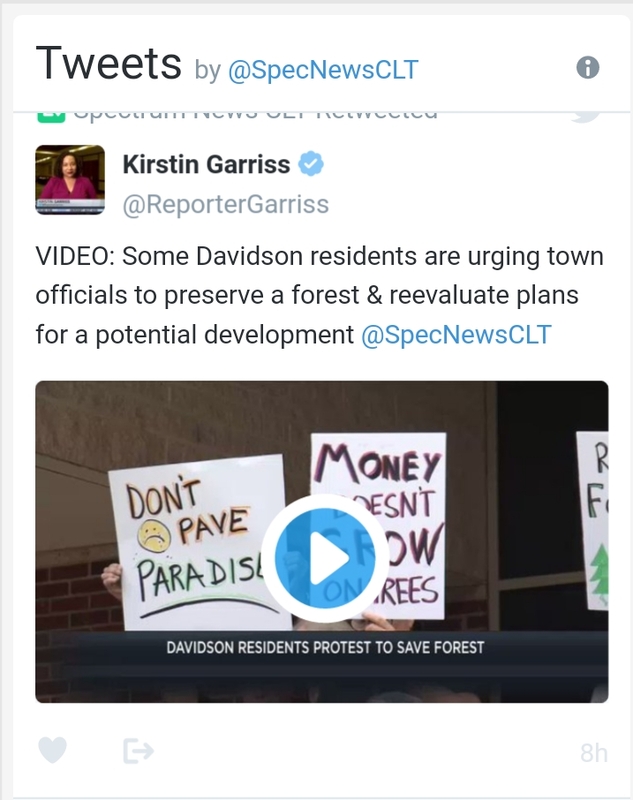 The story about Mooresville planning Lake Davidson with developers long before the public knew sits at #5. With over 700 posts published, three top 5 posts in a single month definitely is unique. However, it should be noted, those posts were just the "gravy". May would have still been a record month even without them. Town Hall and its minions may not like what we do or how we do it here at aShortChronicle, but the public seems to in growing numbers. Then again, there is zero financial stake in this blogging operation for us. The same can not always be said for the interests of those who don't like it. It is time to head to Mooresville Town Hall again on Monday for the next update one of the biggest development stories currently out there for the whole Charlotte region..
At 6 pm, the Mooresville Board of Commissioners will start their regular monthly meeting. On the agenda is a public hearing and potential vote on the rezoning of 140 Acres on Lake Davidson in Mooresville ETJ. Last month, the hearing at the town Planning Board on the same subject drew a large crowd. aShortChronicle expects a large number of Davidson area residents to be in attendance this time as well, possibly with attorneys in tow this time around. At question is Mooresville's interpretation that this is in fact just a "straight up" rezoning that meets with the town's stated plans. If it is not, then this should be a what is called a "conditional" rezoning. 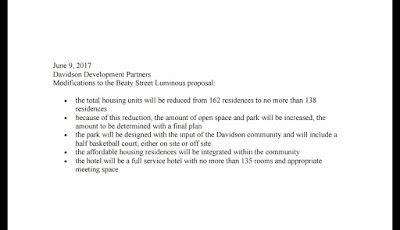 This line of reasoning was part of the conversation when Davidson Commissioners discussed a letter to Mooresville expressing Davidson's concerns with the project. The idea of this being "conditional" rather than "straight up" has also been circulating around the area outside of Davidson Town Hall. 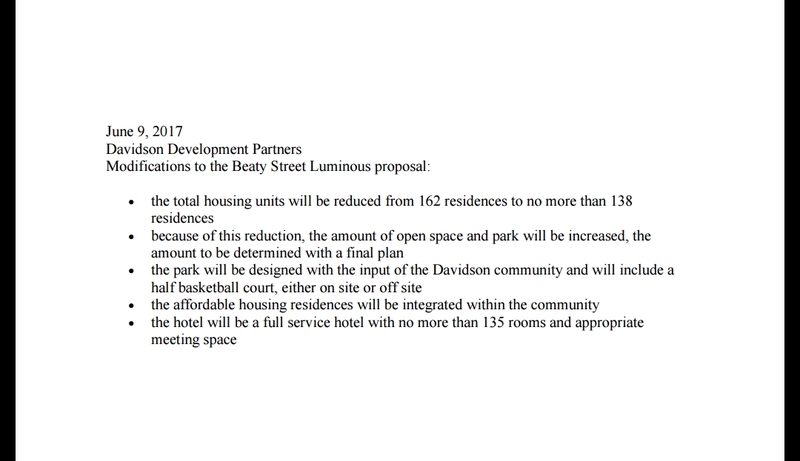 If this rezoning were to be "conditional" rather than "straight up", it would not stop the Lake Davidson project. However, it would allow more control over how any future development occurred. Conditional zonings can get very complicated, but they also can ensure the best development when done right because they can apply project specific conditions rather than giving the developer by right permissions available under standard zoning. Developers generally hate dealing with conditional zoning. By default, that means they likely benefit the public. Also, in play here is the fact that Mooresville just lost a court case over its poor handling of the rezoning request for a new Costco at exit 35. Will that make Board members a little gun shy this time? Head to Mooresville Town Hall tomorrow evening to find out.